The Beam is LIFX’s answer to the Nanoleaf Aurora: A series of colorful panels designed to adhere to a wall, this is lighting designed to be more decorative than it is functional. True to its name, the LIFX Beam is a series of six translucent, beam-like rods, each a foot long and filled with LEDs. Each Beam module has a magnetic connector on either end. When you snap them together, they draw power from the previous module in the line. You can customize the Beam modules however you like, though the base package only allows you to make a single 90 degree turn, in the form of a small square piece that has a magnetic attachment on two adjacent faces. In other words, straight out of the box, you can either use the six modules to make a straight line, or an L shape of some variety. A controller unit attaches to either end of your construction via a cable with a magnetic connector (and dangles unfortunately from the end of the Beam). The system supports a maximum of eight Beam modules and two corners per controller—though extra components are not sold individually, so you must mix and match from a second kit if you want more pieces. 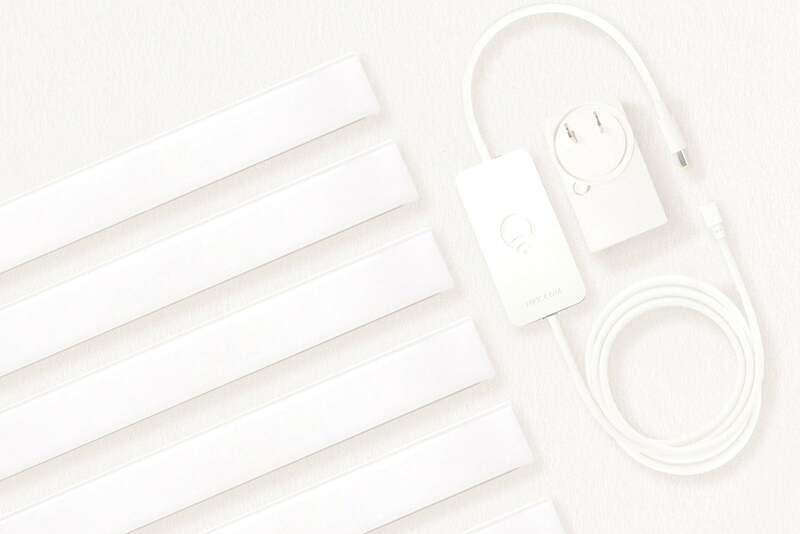 Each LIFX Beam kit includes six foot-long LED light bars, a power adapter, and one illuminated corner. Like the Aurora, the Beam is a lot of fun. It’s easy to lay out the pieces and stick them to the wall. They even work for accent lighting (inside or atop a long bookshelf, for example), but you can do that job more cheaply with adhesive LED strips. What LED strips don’t typically get you is the range of color control that the Beam offers. Like the Aurora, the Beam is stuffed to the gills with special modes that cycle through colors, dim and brighten, or pulse in time with music. These are the same special-effects modes that standard LIFX color bulbs support; but in a six-foot-long bar, these modes execute differently. Color themes can change the entire color of the Beam at once, or slide various colors along the length of the Beam instead, like a spray of rainbow. Most of these features can be tweaked in the app’s Effects tab, but it takes quite a bit of trial and error to get the hang of it all, requiring some shifting back and forth between various tabs and effects (which can often be run concurrently). 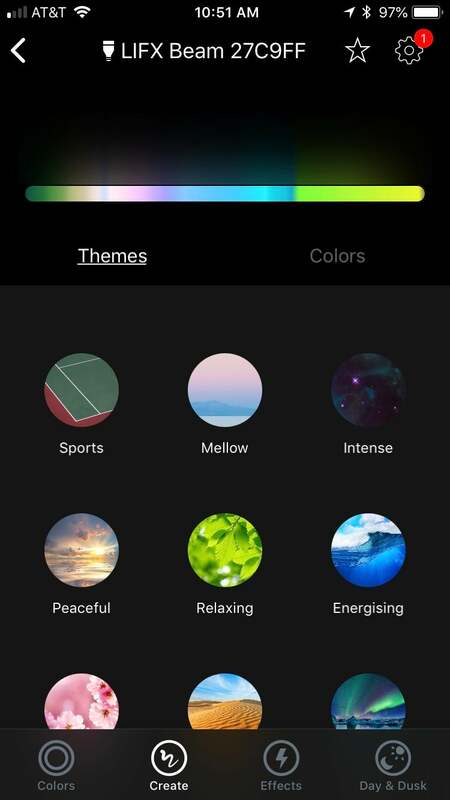 LIFX’s color themes can display a multitude of hues at once–and move them up and down the Beam. Beam is very bright and its colors are rich and vibrant. It consumes 27 watts of power with all six Beam modules activated, putting out about 1,200 lumens at maximum brightness. Aurora panels each emit only 100 lumens at full brightness, and side by side they aren’t nearly as powerful. Beam is painful to look directly at when you dial it all the way up. 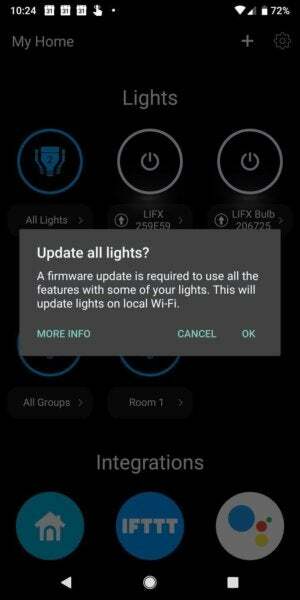 All controls are managed via the LIFX app; although the unit supports HomeKit like other LIFX bulbs, the iOS Home app has virtually none of the settings that appear in the full LIFX app, making it largely useless. At $200, the LIFX Beam is priced the same as the Nanoleaf Aurora, and which you choose will largely come down to what kinds of shapes you want to make with your lights. The Aurora panels consume a large chunk of wall space, but the Beam can fit into tighter spaces. If you’ve standardized your home on other LIFX gear, Beam probably makes better sense, too. Otherwise, if decorative lighting is on your shopping list, you really must ask yourself one question: Are you a triangle person, or are you more into straight lines?